CF have a new website. It looks very good. Owen Meredith has an Inauguration Day piece on what Britain's Tories can learn from Obama. Since my last update in January I have been busy on a number of projects which I am now able to feed back on below. Being on the Executive continues to be both rewarding and infuriating in almost equal measures! I continue to support on a daily basis anyone that has requested help and information and I am usually able to find positive resolutions. Some of these outcomes also inform improved communication on a wider level for example policy forums – see below. We have a number of new branches with individuals contacting me from areas where there have not been active branches for a long time. These people are now pushing not always smoothly but with a determination to succeed. I have continued to travel around although not as much I would have liked – remember if you need some extra support at an event from a member of the executive – just ask! There was a good response to the consultation, it closed at the end of February and it has taken a considerable amount of time to sort through the results before I was able to report back - I am not going to duplicate these results here. The consultation of CF members was an excellent initiative. The geographic impartiality of the internet, combined with the significant number of responses (768) make its results authoritative. I'm particularly pleased that CF Diary got such a positive rating and that the results have been published here for all members to see. For once we actually have some facts on which to base our opinions on the state of Conservative Future, and I'm sure this and other blogs will digest them over the coming weeks. A big thank you to everyone that replied to the consultation. The consultation with members was the first for a long time and was carried out with a zero budget but despite the knock-on drawbacks of this in terms of format it has provided information that will inform work this year and next year's NME in addition to the Communication Strategy I have been working on. There were multiple aims of the consultation including getting people thinking about CF – how it operates, how they can contribute and how they would like to see it develop and also inform membership priorities. Until the new membership database is fully operational determining the number of CF members is difficult but it is widely agreed to be around 15,000. 768 replies were received to the consultation therefore it had a response rate of 5%. Consultations of this sort would hope for a response of between 5% and 10% therefore while the response rate is not great it can be argued it is a representative figure. There's a slight technical hitch in sending out the bulletin this month, in the meantime Christian Walker has sent it to me for you to see on here. Please excuse the rough formatting for now. Just a few days left before it is due to finish. "Am I really bitter that I don’t have a city starting salary? Slightly. But we young Tories are more bothered about status than money. Money, in excess, is ugly. Being a businessman is hardly appealing. Far better to be a lawyer or an academic. Even a GP. These are the respected in society. The children of Thatcher are impressed by how much can be achieved rather than by the depth of a bank account. Thankfully, we have the support base to do that." 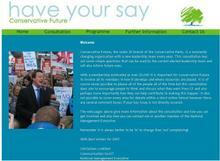 The long-awaited consultation website is now up. It is an excellent initiative - basically a month-long survey asking a number of questions about your experience with CF. I'm having trouble sending my results in though, if you are too it would be useful to let Christian know. I strongly urge you to have your say on it, its results - to be published on CF Diary in a month will be very interesting indeed. While you're in the survey groove, have a go at this month's ConHome survey as well! "I'm delighted to be able to launch a period of consultation for Conservative Future with its members - the first for a number of years. Since its creation in 1998 CF has evolved into an impressive political youth movement now with an estimated 20,000 members that is progressively gaining the respect it has earned and continues to deserve. However no organisation stands still and CF needs to constantly review and adapt when necessary to represent the face of the party’s future. To this end www.cfconsultation.co.uk allows people to have their say. It is of course never possible to cover everyone’s number one issue however the comments boxes provided allow for this inevitable frustration. Please also note that this consultation exercise has been produced at zero cost to the membership. It will also not only inform the current National Management Executive but also those in years to come with the format established to allow for future more regular member feedback. While delivering every request will be impossible we hope that this consultation also inspires debate about CF – what it represents, how it functions and its purpose and more importantly how the membership can contribute to this delivery. All Area Chairmen have been asked to forward on details to their members and it will be advertised in the next Bulletin. Following the closure of the consultation a summary of results will of course be made public to further fuel the aforementioned on going CF debate." December as usual was a busy month for everyone especially in Conservative Future; this followed a busy three months with new branches being created in a number of marginal seats. As well as addressing communication (my main focus) I have also concentrated on new marginal seats being able to attend events including ones in Torbay, Worcester, Stroud and Derby concluding with the CF Christmas Party in London. When the website is complete I will be contacting all Area Chairman to ensure they have its details as well as more officially touching base with them during the second quarter under this leadership team.